If you just started living alone and now looking for a small burner that will fit your countertop, or if you simply want a portable hot plate but you don’t know how to choose one, then you have come to the right place. In this article, I will tell you all about how you can get the best hot plate for small spaces. Below, you will learn about the different features of a hot plate and the best hot plates you can buy today. So how exactly do you choose the best hot plate for your home? When it comes to hot plates, there are actually a couple of important factors that you need to look out for in order to get the best one for your home. Below I will tell you about 5 important factors including the material, power source, features, size, and safety features that a hot plate can come with. Familiarizing yourself with these different features will help identify the right hot plate that is truly worth the price. A hot plate can be made with all sorts of materials including ceramic stone, stainless steel, die-cast metal, electric heating elements, tempered glass, and more. To help you get familiar with these materials, let me provide you with a brief description for every one of them. A ceramic stone hot plate is very easy to clean. It can retain its heat very well for up to one hour after cooking. A Diecast metal hot plate, on the other hand, is quite durable and heavy. It’s also able to conduct and retain heat very well. Most diecast metal hot plates are used with natural gas burners. An electric heating element is the one that usually comes with induction hot plates. Electric heating elements are usually quick to heat up and easy to clean. They are also very safe since they don’t expose you to open flames. Stainless steel hot plates are probably the easiest to clean of all the kinds since you won’t have to worry about scratching or damaging the steel with a rough cleaning pad. Stainless steel hot plates are also very durable and can retain heat very well. Tempered glass hot plates are also great for quick heating and easy cleaning. Perhaps the only downside to tempered glass hot plates is that they are quite fragile. You wouldn’t want to drop a pan in a tempered glass hot plate since it may cause the glass to crack. Hot plates can gain power from different sources including microwave and oven heating, electricity, and propane or natural gas. Whatever your power source may be, the effectivity of a hot plate is mostly determined by the material it's made with. But if I had to make a suggestion, try to go with a hot plate that is powered by electricity if you plan to use it at home. However, if you wish to get a hot plate for outdoor or emergency use, then you might as well go with one that gets its power from propane or natural gas. Hot plates can come with several features that can add to its overall convenience. 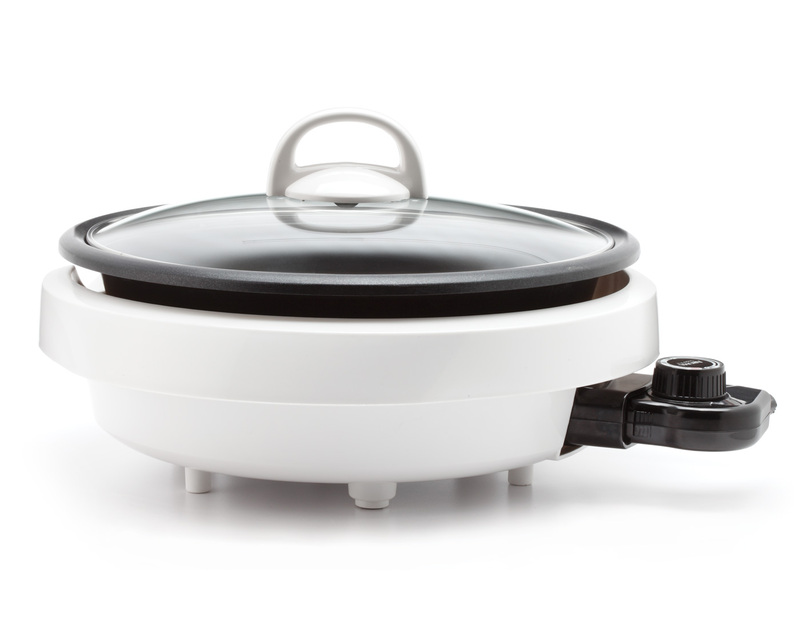 Be sure to check out if the hot plate you are looking to purchase comes with a drip pan for easy cleaning, a magnetic stirrer, a power indicator and a power switch for added safety, adjustable temperature settings for added accuracy during cooking, and a timer for added ease of use. At the end of the day, make sure that you get a hot plate with a set of features that are not too complicated but just right for your cooking needs. Hot plates can come in different shapes and sizes. Some hot plates can only accommodate mugs, while others can accommodate pots and pans. When it comes to choosing a hot plate based on size, make sure that you measure your available counter and storage space beforehand to make sure that the one you choose will fit just fine. Any tool that can radiate enough heat to cook food can pose safety risks. This is why you should never forget to consider the safety features that come with the hot plate. Try to look for a hot plate with surfaces that can stay cool to the touch. Also, try to choose one with a stable non-skid base. Other safety features you should look out for are safety switches, child locks, and electric or retractable cords. If you are looking for a single burner hot plate that you can easily use at home, then you should check out this Cuisinart CB-30 Cast-Iron Single Burner. It has a compact size that didn’t compromise its overall functionality. This hot plate can accommodate a single pot or frying pan and can effectively heat up within minutes, thanks to its heavy-duty cast iron plate. This single burner cast iron hot plate can also retain heat very well after cooking, which means that you can turn it off and still be able to keep your food warm before serving it. Another great thing about this hot plate is that it comes with 6 adjustable temperature settings that will allow you to cook all sorts of food without burning them. For added safety, this hot plate also comes with a coil-less design, making the pan or pot settle stably at the hot plate. It’s coil-less design also makes it very easy to clean and maintain. All you really have to do is wipe it down with a wet and soapy rag and wipe it again with a dry one to get rid of all the dirt and grease. Another great countertop hot plate with a sleek design is the Secura 8100MC. This is an ideal choice for those living in small apartments and condominiums because it doesn’t take up a large counter space. What’s great about this hot plate is that it doesn’t consume much energy despite being able to heat up pots and pans really quick. It is powered with 120 volts, a standard for most households. This hot plate also comes with a digital control panel that gives it a modern look. The panel will allow you to view the countdown timer, temperature, and power level. The panel will also allow you to control all of the functions that this hot plate can offer, making this so simple to use. Another interesting feature of this hot plate is its automatic pan detection feature that will automatically turn the whole hot plate off if no pan is detected within 60 minutes, making it a much safer tool to use at home. 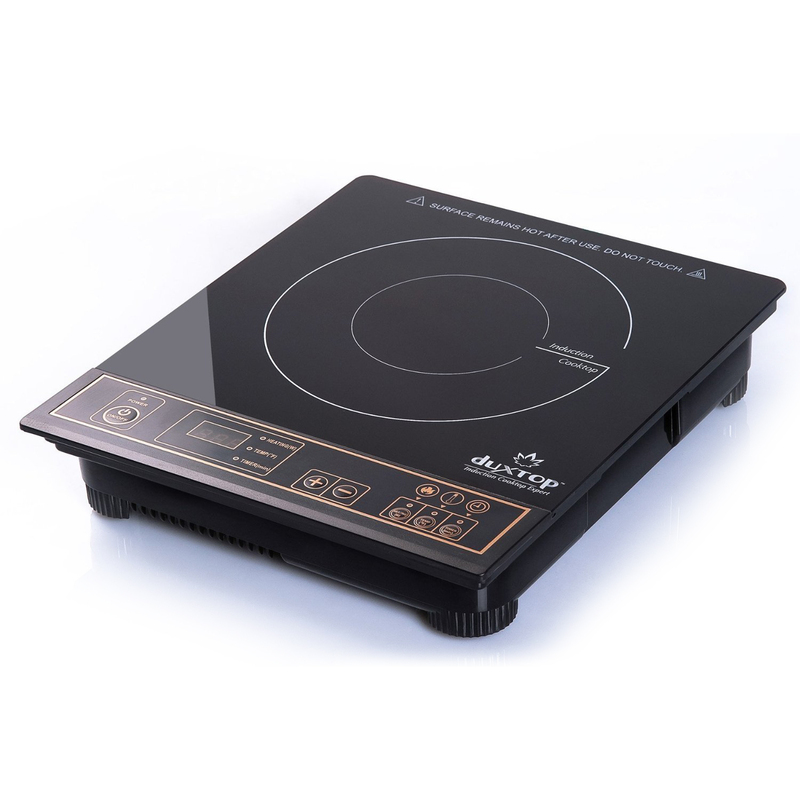 It is not easy to find the best hot plate, but for us, it's the Secura-8100MC-Portable-Induction-Countertop as you are assured of automatic shut-off and saving energy. This hot plate is also quite easy to clean and maintain since all you really have to do is give it a thorough wipe to get rid of grease and residues on its cooking surface. If you’re the kind of person who’s into Korean barbeques, deep dish pizzas, and healthy cooking, this 10-inch hot plate grill may be the best one in this list for you. It comes in a small design and it packs a lot of great features that make it a highly versatile tool in the kitchen. What I like about this hot plate is that it comes with a 10-inch deep dish grill. It is so deep, it can double as a pan. With this hot pot at your disposal, you will no longer need any cooking pots or pans, which means less clean ups and fewer tools to store in your kitchen. This hot plate is also designed with a grill plate that doesn’t get flooded with grease. It comes with a raised grilling surface that will let the grease drip away from your food. With this hot plate at your disposal, you will be able to grill, steam, simmer, slow cook, and serve your food piping hot to yourself or to your guests. Another thing I liked about this hot plate is that it is very easy to clean. In fact, it’s even dishwasher safe. If you’re the kind of cook who likes precision and accuracy, then I’m sure you’d enjoy using this hot plate that comes with a Robertshaw thermostat, which boasts of infinite heat control setting. 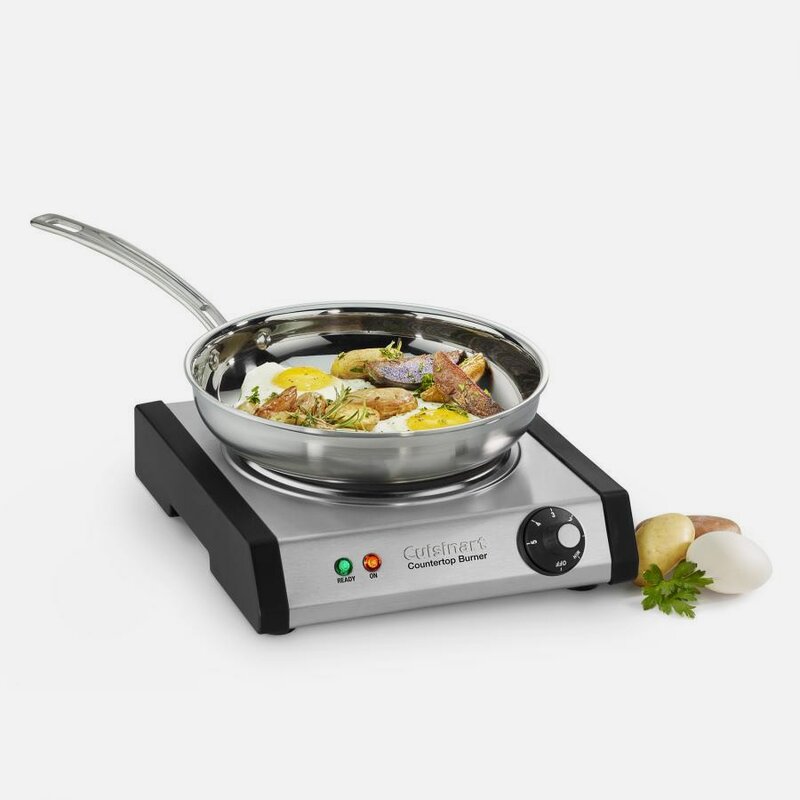 With this hot plate at your disposal, you will be able to thoroughly cook all sorts of ingredients to your liking. This means that you will be able to effortlessly get a perfect sear on a good piece of steak while attaining a pinkish medium-rare meat inside. What I like about this hot plate is its overall simplicity. It comes with a simple on and off rocker switch that will allow you to instantly turn this thing on for heating and off during emergencies. Another great thing about this hot plate is that it comes with a light indicator that will let you know when the burner is turned on. This hot plate is also easy to clean and maintain. It comes with a durable stainless steel housing that doesn’t scratch easily, which means you can use the toughest of cleaning pads to get rid of nasty stains and grease build ups. Lastly, this hot plate is able to heat up pots and pans really quickly because it comes with an 8-inch tubular element that comes with a high-speed heat up function. So if you’re really hungry and you want to start cooking or if you want to reheat your food, this one will help you get the job done in mere minutes! 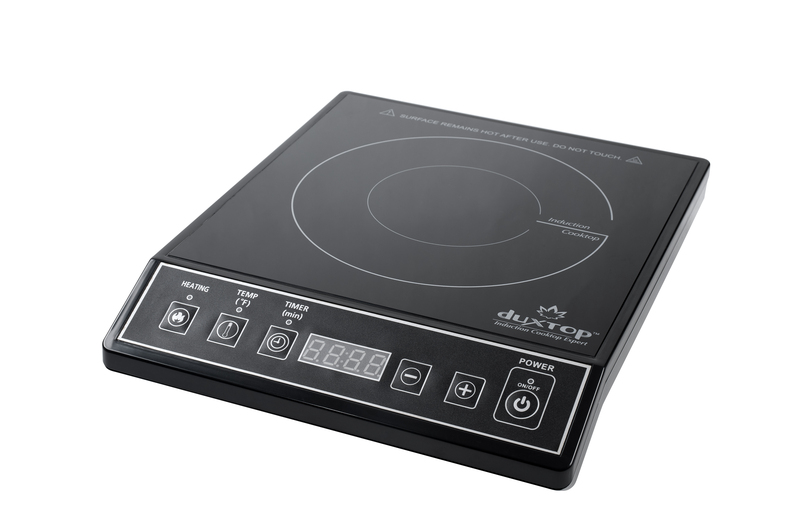 The Secura 9100MC hot plate burner is one compact induction cooktop that is perfect for small counters. What's great about this hot plate is that it comes with a heating element that is compatible with all sorts of cookware such as induction, duxtop, cast aluminum, enameled iron, enameled steel, stainless steel, and even cast iron pans. It also comes with 15 power levels that will allow you to set accurate cooking temperatures ranging from 140 degrees Fahrenheit up to 460 degrees Fahrenheit. You don’t even have to worry about its energy consumption as you cook in high temperatures since it only needs a maximum of 1800 watts to maintain high heat levels for cooking. Another great feature of this hot plate is its digital control panel that makes it very easy to operate. What’s more is that its overall design including the induction plate and the control panel can easily be cleansed with a single wipe of a soapy washcloth. This hot plate can also be used in the car since it can run with just 120V 60HZ AC power. If you have a car inverter with you, then you can easily camp out with this little bad boy and make great meals outdoors. It really depends on your unique and personal needs. 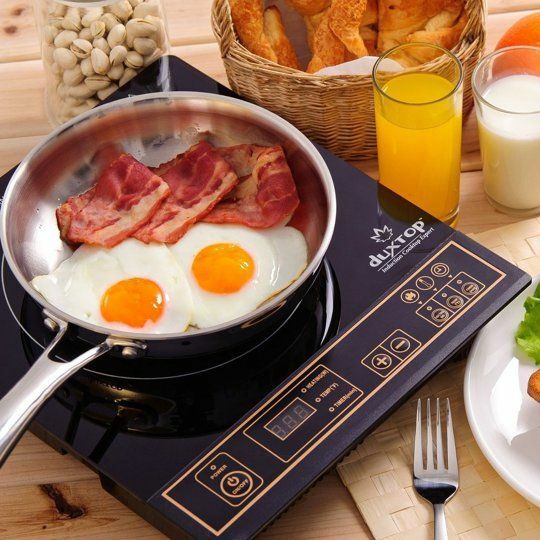 If you like camping a lot and you have different types of cookware at home, you would want to buy something as versatile as the Secura 9100MC 1800W Portable Induction Cooktop. It’s a bit more expensive but for its versatility, every penny is worth it. 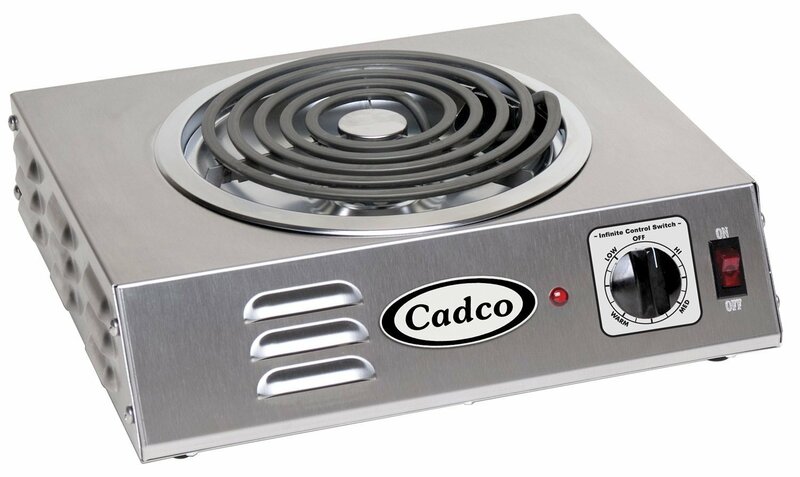 If you are looking for an efficient hot plate where you can cook a variety of foods, even thick slabs of meat, get the Cadco CSR-3T Countertop HI-Power Single Hot Plate. It has a good heating element that can achieve different temperature levels. For those looking for a hot plate that won’t break the bank, get the Aroma Housewares ASP-137. It is the cheapest, but it isn’t lacking in features. You can even replace your pots and pans with this. If you hate a complex set-up, get the Secura 8100MC Portable Induction Countertop. It is simple to use, and the digital functions are easy to understand. If you are looking for one that can offer different temperature settings, the Cuisinart CB-30 Cast-Iron Single Burner is the ideal choice. It has straightforward functions perfect for an uncomplicated kitchen set-up. Make sure you click the links of the products you think is the best fit for you. You can also check out our homepage for more kitchenware and tools suggestions as well as read more tips and guide on how to buy.